Fight for $15 won an important victory with a new law in NYC offering an inroad to unionizing low-wage workers through a new type of labor organization. Flavia Cabral doesn’t equivocate. She joined the fast food worker movement, she said, for a single reason: to put her daughter through college. Cabral, 53, of the Bronx, earned $7.25 per hour at McDonald’s when she stood alongside coworkers in her first single-day strike four years ago. Over 10 strikes later, she makes $12 per hour, thanks to a statewide minimum wage hike that will gradually elevate her pay to $15 by the end of 2018. Still, her goal remains out of reach. Cabral’s predicament is emblematic of one facing the Fight for $15: how to move beyond its titular demand to address other barriers that are keeping fast food workers from a middle class life. These obstacles include insufficient hours, non-union workplaces and crippling expenses like housing, health insurance and college education. Fight for $15 won an important victory on one of these fronts in late-May when the New York City Council passed a bundle of laws that guarantee predictable schedules and require restaurants to offer additional hours to current workers before hiring new employees. Similar laws have been passed in cities like Seattle and San Francisco. A less heralded law within the package of New York City reforms, however, may hold the future of the fast food movement — and, if successful, will offer an inroad to unionizing the 42 percent of American workers who make less than $15 per hour. The ordinance allows fast food workers to join a new type of labor organization, which will advocate for workers throughout the industry and sustain itself through dues deducted voluntarily from workers’ paychecks. It is, some say, the kernel of what could become a sector-wide fast food union — the movement’s holy grail. In order to begin deducting dues from workers’ paychecks, the new organization, Fast Food Justice, needs to sign up at least 500 workers and it aims to do so by the time the law goes into effect at the end of November. Labor leaders in other cities and low-wage sectors are watching closely to find out if the model is worth replicating. When it began in New York City in 2012, the Fight for $15 made two demands on behalf of fast food workers: a $15 per hour minimum wage and union representation. Due to a headline-grabbing campaign of single-day strikes, the former has enjoyed increasing popularity and policy success. Last year California and New York each passed a statewide $15 minimum wage; cities like Minneapolis and Seattle have done so, too. When introduced in April, a U.S. Senate bill calling for a $15 minimum wage garnered support from 24 senators, including progressive stalwarts like Bernie Sanders and centrist members like Charles Schumer and Cory Booker. The union demand, on the other hand, has stalled. The urgency behind this demand springs not only from a need for worker gains but movement stability. Since its inception, Fight for $15 has received the entirety of its funding from dues-paying members of the Service Employees International Union, or SEIU. But the 2-million-member labor organization will cut overall spending by 10 percent this year and 30 percent in 2018 as it braces for Trump era political battles and an unfavorable Supreme Court decision in Janus v. AFSCME — a relitigation of Friedrichs that could substantially reduce membership in public sector locals. As of last year, the union had spent $70 million on the fast food campaign. It has yet to reap a penny in dues from an industry worker. That said, Figueroa acknowledged that gaining union representation remains a goal of the campaign. Cabral agreed. “We want to fight for $15 and a union,” she said. Obstacles to unionization for the 3.67 million fast food workers nationwide, or even the 65,000 in New York City, are daunting. Rapid employee turnover coupled with the industry’s franchise model renders traditional store-by-store organizing difficult. The National Labor Relations Board allowed for an alternative in 2015 when it loosened its standard for whether a corporation, say McDonald’s, can be considered a joint employer along with its franchises, opening the door for a union of McDonald’s employees nationwide. But a Trump-appointed board is almost certain to reverse the NLRB decision. Figueroa pointed to a successful 32BJ drive last year that forced multiple contractors at airports in New York and New Jersey to recognize a union of 8,000 security and maintenance workers. It raises the question: can Fast Food Justice enable the first step toward a concrete fast food worker organization? 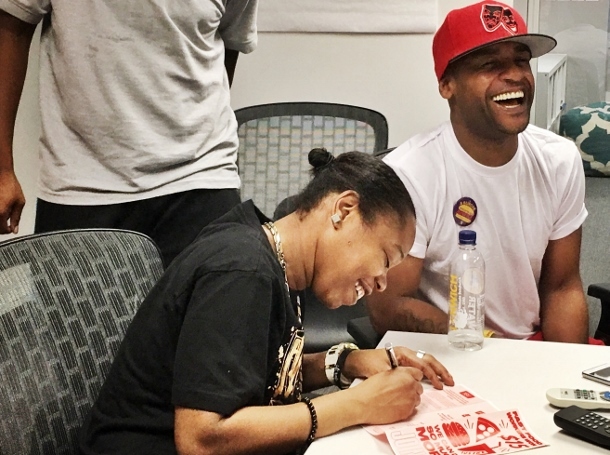 Fast Food Justice works like this: If at least 500 workers sign up to join the organization, it can begin receiving contributions from workers who voluntarily deduct money from their paychecks. Employers, then, are responsible for transferring the payments to Fast Food Justice. It’s as simple as that. 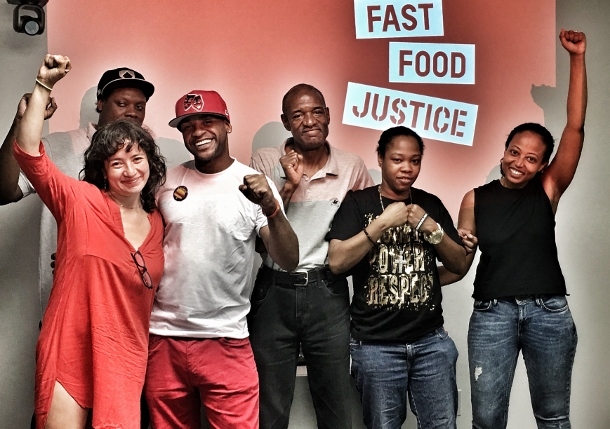 The group plans to function like a sector-specific community organization, offering education on worker rights and advocating on issues that confront the fast food workforce, which is disproportionately black and Latino. “When you talk to workers they don’t just raise issues in the workplace, a policy advocacy organization can make a difference for them at the New York City Council to effect change in different ways and provide outreach and education,” echoed Tsedeye Gebreselassie, a senior staff attorney at the National Employment Law Project and a board member of Fast Food Justice. This advocacy model is hardly unprecedented. Membership-based groups like the Retail Action Project and the Taxi Workers Alliance, which represents 19,000 taxi drivers in New York City, lack collective bargaining rights but achieve gains on the job through political mobilization off it. The Taxi Workers Alliance, for instance, organized its largely immigrant membership to carry out a ride boycott at JFK airport in January in response to the Trump travel ban. Fast Food Justice will borrow from these forebears but will operate under an entirely new funding mechanism. Other groups ask workers to pay a monthly or yearly fee, but deducting voluntary dues directly from paychecks will allow the organization to secure regular contributions from workers who may lack bank accounts or debit cards. “Once you have dues check off, it’s much easier if you’re automatically opted in and then don’t have to think about it again,” Lichtenstein said. More importantly, it centers dues payment within each member’s store. Fast Food Justice will benefit from sector-wide breadth and the massive potential membership base it provides. But unlike its peers, the group will anchor membership in worker’s relationship to a specific store and boss. “You can begin to have shop stewards in every store,” Lichtenstein said, likening the organization to a right-to-work union before catching himself. “The more we like it, the more it looks like a union; and the more it looks like a union, the easier it is to attack it legally,” he said. Legal anxieties, in this case, aren’t illustrative of an embattled left crying wolf. They’re warranted. A lawsuit could claim that the ordinance preempts the federal National Labor Relations Act, which retains jurisdiction over what constitutes a labor organization, Lichtenstein said. A passage within the New York City law explicitly states that it does not allow for contributions to a labor organization, as defined by the NLRA. But a restaurant trade group or conservative organization may argue otherwise. Ironically, the prospect puts Fast Food Justice and 32BJ officials in the position of arguing that the new organization doesn’t resemble a union, while critics argue that it does. Kevin Dugan, a regional director with the New York State Restaurant Association, a trade organization that opposed the law, disagreed. Despite the saber rattling, Dugan acknowledged that neither the New York State Restaurant Association nor its nationwide umbrella organization is currently planning to challenge the law in court. Of course such plans may change or another adversarial group may step in to fill the void. For now, though, the only obstacle preventing this organization from collecting worker dues is the minimum 500 sign-ups necessary to trigger payments. The organization would like to reach that number by the time the law goes into effect at the end of November. At first glance the task may appear easy, considering the group can draw from a base of 65,000 workers. But Fast Food Justice is gearing up for a massive organizing campaign to reach this initial goal. The organization has already begun hiring organizers and signing up workers, Fast Food Justice spokesperson Eliza Margarita Bates said. But there’s reason to be skeptical, as the organizing challenges that have dogged Fight for $15 are still at play. While the organization achieved a $15 minimum wage hike in New York State through a massive multi-year mobilization, turnout at strike-day rallies was made up predominantly of community members. The first fast food strike, in November 2012, saw an estimated 200 workers in New York City walk off the job and, based on news reports, the movement peaked at 400 workers turning out to strike. One can fairly assume a degree of overestimation in such numbers, which were self-reported by Fight for $15. Participants did risk retaliation from management, but they were not asked to contribute money. The single-day strike tactic began in New York before spreading to hundreds of other cities and drawing in thousands of low-wage workers. A similar fate may await this organizational model, which could begin its expansion with statewide legislation in Albany. Appelbaum disagreed, saying, “what we’re seeing is that in fast food this legislation may be the right way to go. That does not mean it’s the right way to go in other industries.” He noted the success of RWDSU organizing retail workers in New York City, like the breakthrough at Zara, where over 1,000 workers unionized last year. “In fast food, where there is no real organization at this point anywhere, the model that was proposed makes sense,” he said. The spread of this organizational model will likely depend on the political winds in large municipalities and states considering adoption. The growth of the model may prove a bellwether of the struggle between pro-business Trumpism and the labor resistance — both within and outside the Democratic party — that has emerged in the aftermath of November’s unexpected election. But Cabral said the movement will endure, regardless of who’s president.